Well, if you haven’t heard yet, then you will have heard it here first! I have to admit that I received an advance copy so my review will be further down the page. All Rachel Marcus wants is a cool job, a guy who has all his own teeth and a decent cup of tea. Is that too much to ask? Rachel Marcus has a great life and an amazing job as a top copywriter at an advertising agency in Johannesburg, or rather Rachel Marcus HAD a great life and an amazing job as a top copywriter at an advertising agency in Johannesburg – right up until she got fired. Forced to sell everything she owns and leave Joburg in a hurry, Rachel decides to move to New York City, where she plans to make a fabulous life for herself and prove to everyone back home that she’s not a complete disaster. Except the only job she can find is at a crap ad agency, with a hippie freak for a boss and an alcoholic drug addict for an art director. The only apartment she can afford is the world’s smallest cockroach-infested rat trap. And all the men she meets are stalkers, ex cons and whack jobs. In fact, the only up side to her new life is her new best friend – her frustratingly petite neighbour, Sue. Will Rachel Marcus ever get it together or is she destined to spend the rest of her life working on ads for sanitary pads, trawling Internet dating sites and dreaming of that elusive cup of Five Roses? Only time will tell, but one thing is for sure: living in the Big Apple will change Rachel’s life forever. It was chick lit with an edge. Not the usual fare that one gets when reading about a girl looking for a guy, you know the usual story – girl meets guy, girl gets together with guy, something happens they break up, then get back together again and live happily ever after…This was so much more than that. ‘A Million Miles from Normal’ has substance. The characters are vivid with a realness about them which makes you want to get to know them. The reasons for Rachel leaving Joburg are not revealed straight away, and when they are revealed, it is in such a way that you feel for Rachel as you would for an ‘In real life’ person. The descriptions of New York City makes you feel as though you could be there, in Rachel’s shoes, even if you have never been there before. And the references to ‘Five Roses Tea’ adds a particularly homely touch which adds that extra touch of humour and quirkiness, that I have yet to find in another ‘homegrown’ book. This book has a believability about it, and the story is an interesting one, it focuses on Rachel’s job at a ‘below the line’ advertising agency and the people she meets. It is her experience in New York which brings an honesty to the pages and your own reading pleasure. 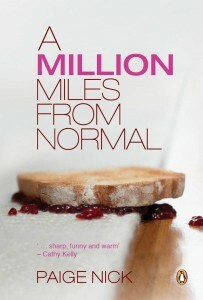 ‘A Million Miles from Normal’ is hugely entertaining, I enjoyed it immensely and I definitely recommend it.